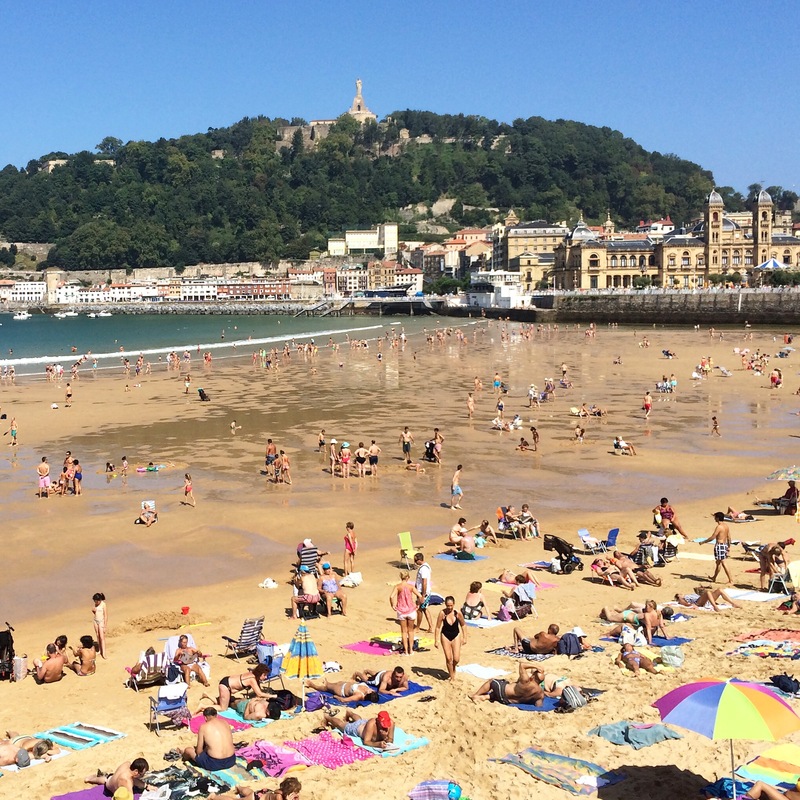 Sunning ourselves in San Sebastiano, life is tough……. It’s a tad like world War Three here at the moment, there are canons blazing, bells ringing, muskets shooting, and 300 drummers drumming, and if I did not know better I would have thought our illustrious Prime Mister had sent his ammunition to the wrong destination. But, no nothing so evil as that, it’sIt’s the 31st of August, and we are residing in Calle 31 de Agosto and it’s. It’s the 201st anniversary of the siege of San Sebastian, and the date that the allies of Britain and Portugal ‘freed’ the city from the French. All good stuff chaps, but then sadly back then, a few days later things went awry. The victors soon found copious quantity of brandy and wine; over-did the celebrations, started looting, found more booze going on and massacring nearly 1000 locals, then burning most of the city. All of which just goes to show you should keep your noses out of other peoples battles! Our little abode is in one of the few surviving buildings, and as we ‘back on’ to the Monte Urgull we are right in the middle of the celebratory action. We had “the full monty” this afternoon. Have never seen so many drummers: very impressive! Anyway the boys’ band and the guns have now moved to the other side of the monte (mount), and are doing a pre dinner show for the rest of the city! ….But I am days ahead of myself. The over eager side of moi pops out so easily, but I will try some restraint and get this monologue back on track. Where did I leave you? Doing ‘my toilet’ before we took off for dinner in Bordeaux of course! Well, our plan to go ‘bordelaise’ meal sort of fell in a hole. The restaurant of choice had very few diners, and they all looked British (sorry ‘Grumpy John’, no you would not have liked them either, they were very Tunbridge Wells ), never a good look when one is looking for food. 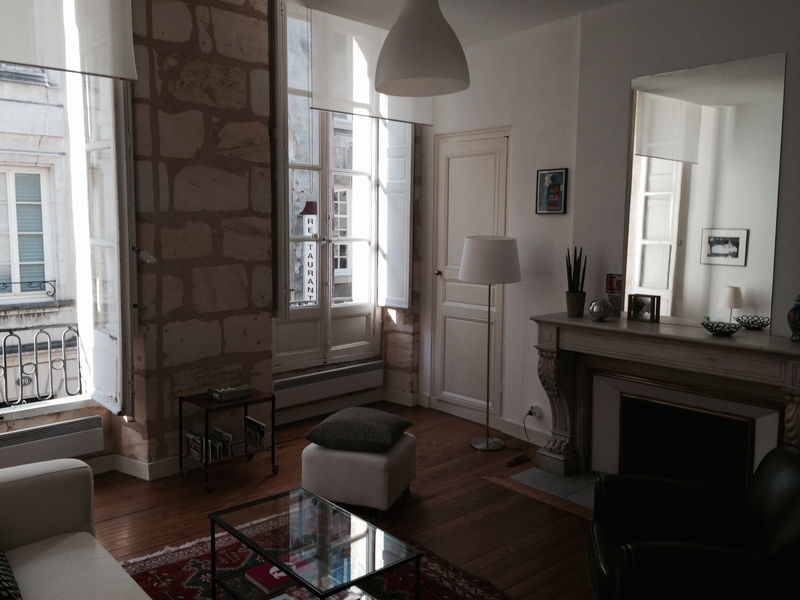 We back tracked, found a pleasant place in our area and dined en famille very happily. Next morning we packed, stuffing the car with baggage, then stuffed in a bit more. The car is now our mobile dressing room. 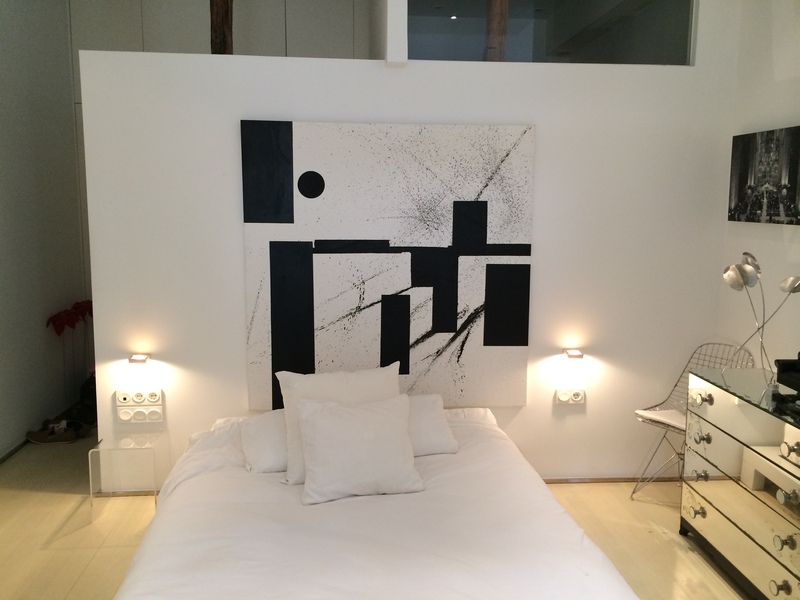 We have packed smaller cases, and have a hanging compartment for things that need to hang, a wine storage area for wine, a dirty linen area, and a ‘why did we pack that’ area and a very large area for food. I can’t contain myself, I see stunning produce and just have to have it, what type of fetish is that? Departure time: and I needed to have a planned exit from our underground car park that did not involve ‘bollards’, so being a good Virgo I had it sorted. Well…. even Virgos have issues occasionally. First up, the car-park pay machine did not like my credit cards (just like those vile oil companies who keep rejecting me). Moving along, I tried cash: everyone. Everyone loves cash – they don’t have to declare it in their tax returns, but the machine did not take 50 Euro notes, so I popped in a 20 Euro. 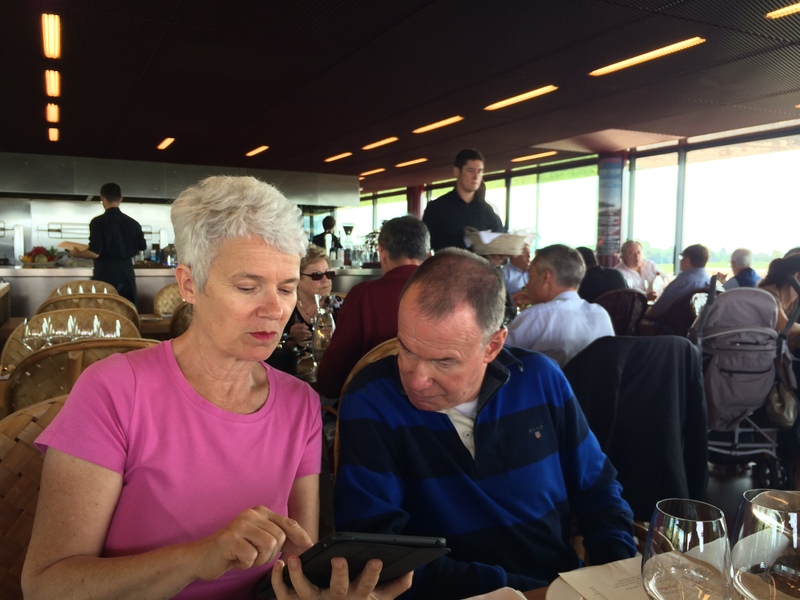 That was O.K., but the bill was 37 Euros, so do you think it would accept any more lovely cash? Not on your life Nellie! I poked and I prodded, but nothing other than ‘rejection’! I then became desperate, and as is our want, I high jacked two little old ladies. They proved less than able to deal with it, but after 15 minutes, they came up with the option of me paying them and they would pay my bill with their credit card, (no English was involved on their side and no French on mine). It worked a treat! We finally could leave the subterranean car park. He likes to wave goodbye! I whizzed up like a native and came to a screeching halt at the top: there was a fence across my planned escape route, and every other one had bloody bollards! We then watched a guy, presumably working on a nearby building, parking his “boy ute” (you know the type: ute on steroids) in an area suited to bikes. After what seemed like a 27 point ranking session, he was finally parked and the fence was moved to ‘lock’ him in thereby opening up our escape road. 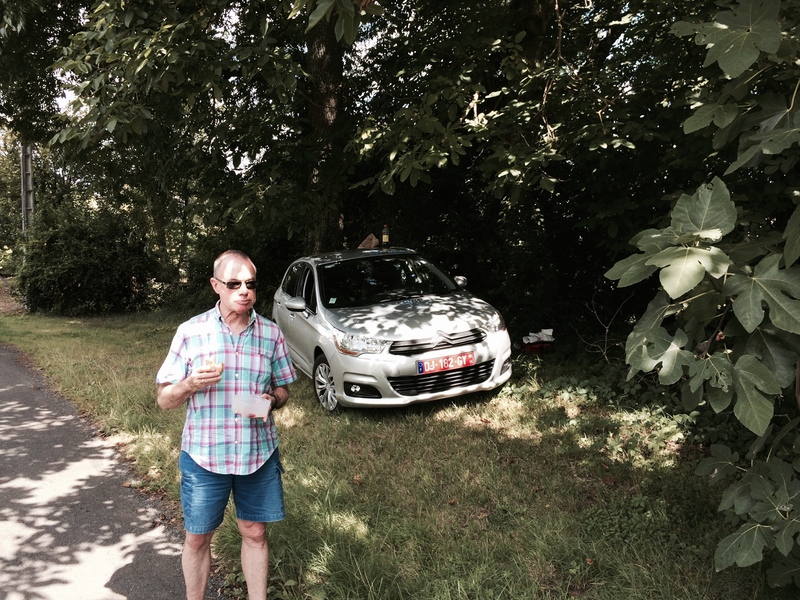 We then motored down several cobbled lanes (think: foot path width) onto Rue Victor Hugo, across Pont Pierre doing a bit of nifty foot work combined with some gear crunching ending up at the Bordeaux Botanic Gardens, via a boulangerie for a baguette for our picnic lunch. 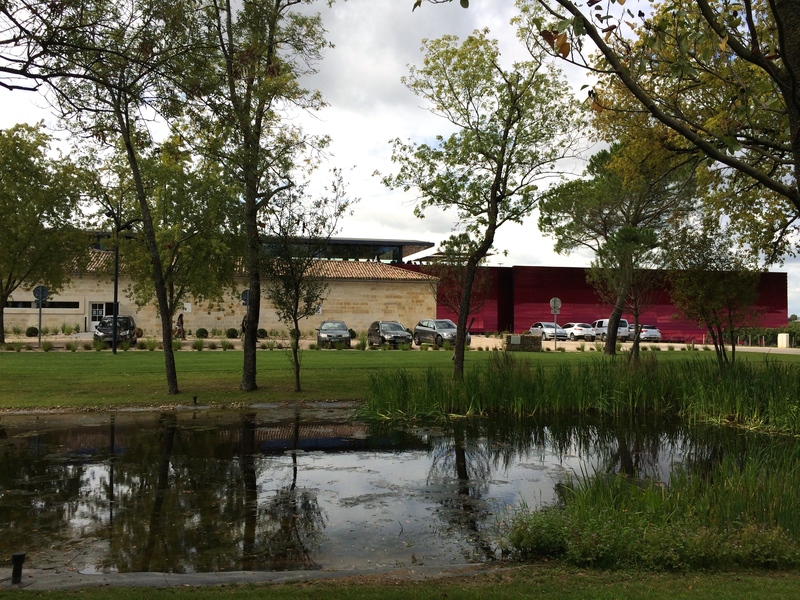 Gardens dealt, we we then motored towards our next destination, Château Carbonneau at Pessac sur Dordogne. En route we picnicked under an old walnut tree on the previously mentioned baguette, plus cheeses, saucissons, salad and other goodies; not to mention two raisin and crème pastries. Château Carbonneau is an 1850’s heap, and stunning! Six guests rooms, acres of gardens and even more acres of vines with an amazing chatelaine, Jacquie Franc de Ferrière, a New Zealand lass married to a French boy who grew up abroad but moved to France 20+ years ago and did a Thorn Park number. It was very nice, made even better when our mates Roger & Dorothy arrived from down town Gilberton, in South Australia the eve before, so we had playmates for 48 hours! We dined well both nights. Jacquie is a good cook. Super, simple food. 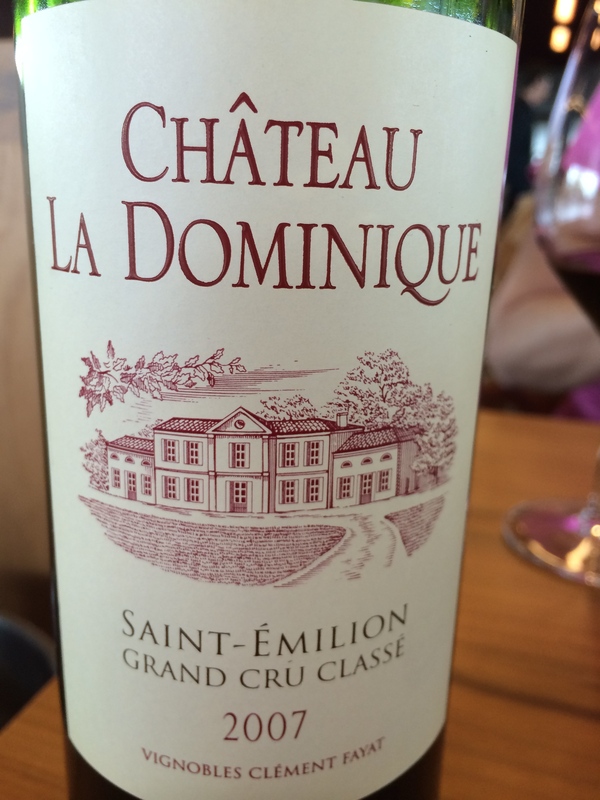 Great wines from the estate – probably too many, but we needed to help the local economy! Very entertaining other guests also, coming from Oz, Germany, the UK and even a French couple. The Chateau had been in near ruins, but is now very smart but not too over the top. I walked a lot, he slept a lot. 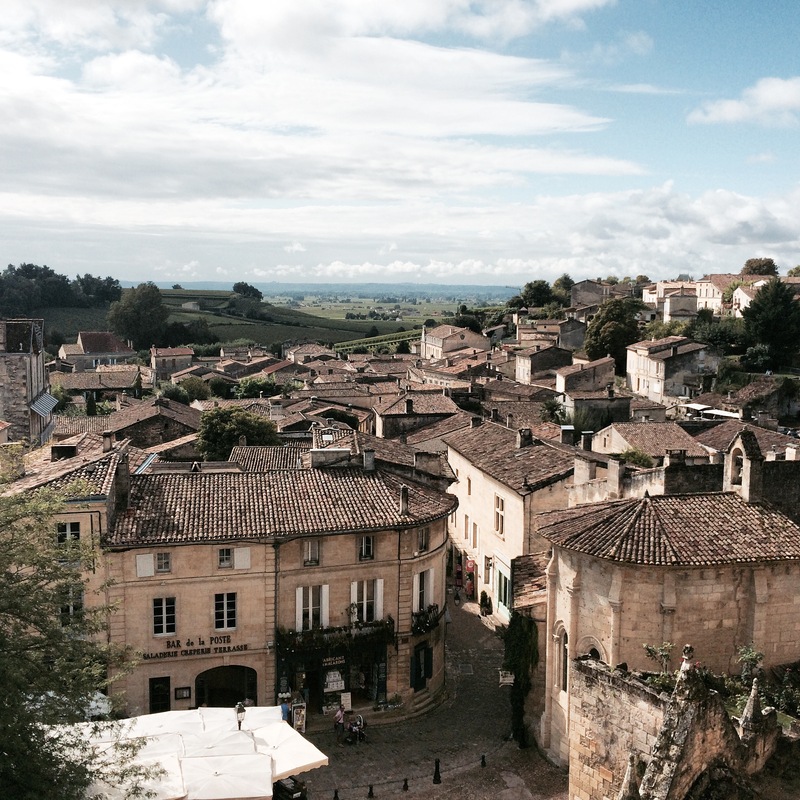 We really only had one full day, so tour leader ‘Dorothy’ had done the research on “St Emilion”, and that’s where we headed. We did a tour of this city and also its amazing caves underneath. These included a 12th century underground monolithic church and nearby catacombs. Seems “St Em” was a bit of a funny chap – on the run from the Benedictine Order, so he took to cave living. Not sure what he did to upset his mates from the order, but he went on to do the odd miracle or three and became a saint. 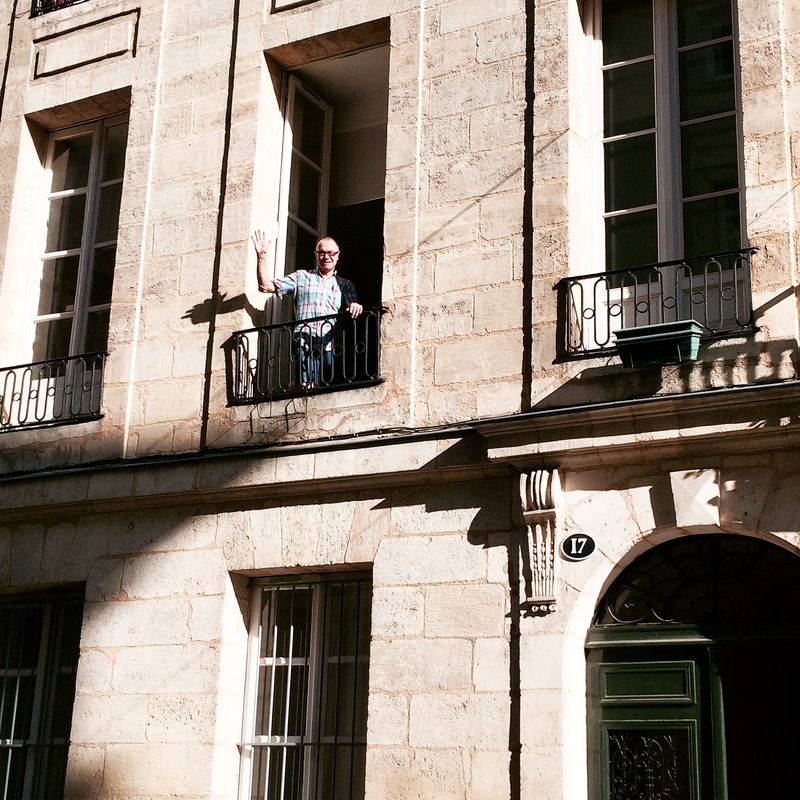 The town is named after him and it’s now the ‘in spot’, wine and tourism-wise in the Bordeaux region. Though some of the prices we saw made Penfold’s Grange look like a Target special during the summer sales! It’s a very, very picturesque town. Tourism and wine dealt with we moved along to food. Tim Johnson from “Juveniles Bar” in Paris had ‘face booked’ me (‘ now so trendy with all the social media stuff) with a recommendation for lunch. It’s new, it’s very, very, smart, so off we went to La Terrasse Rouge, La table du chateau at domaine la Chateau Dominique, in other words, they served lunch and dinner on the terrace roof of the winery. 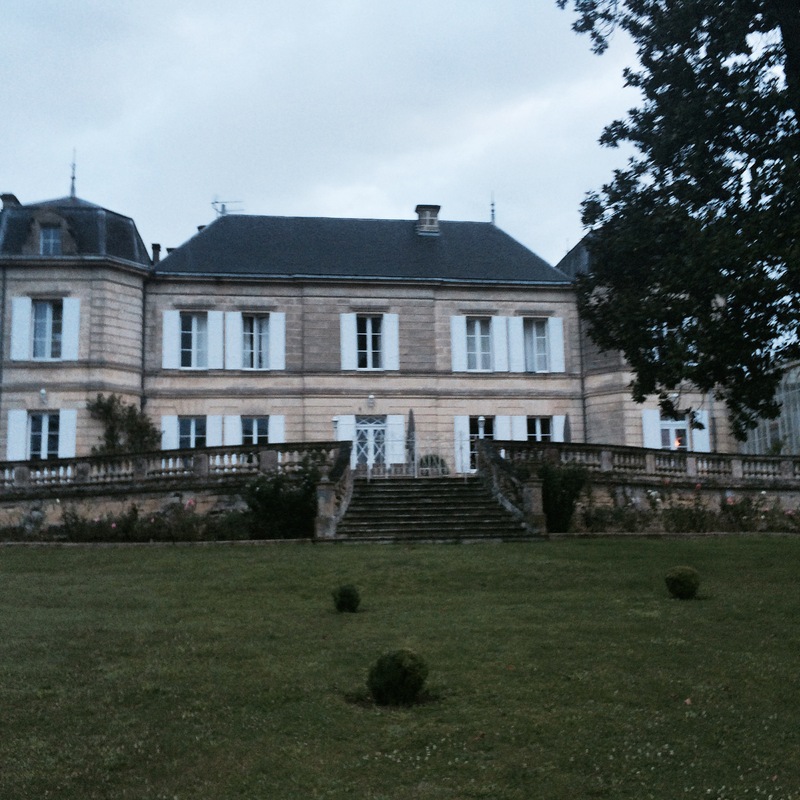 Take one old chateau, do some reno’s, add a huge extension at the back for winemaking. 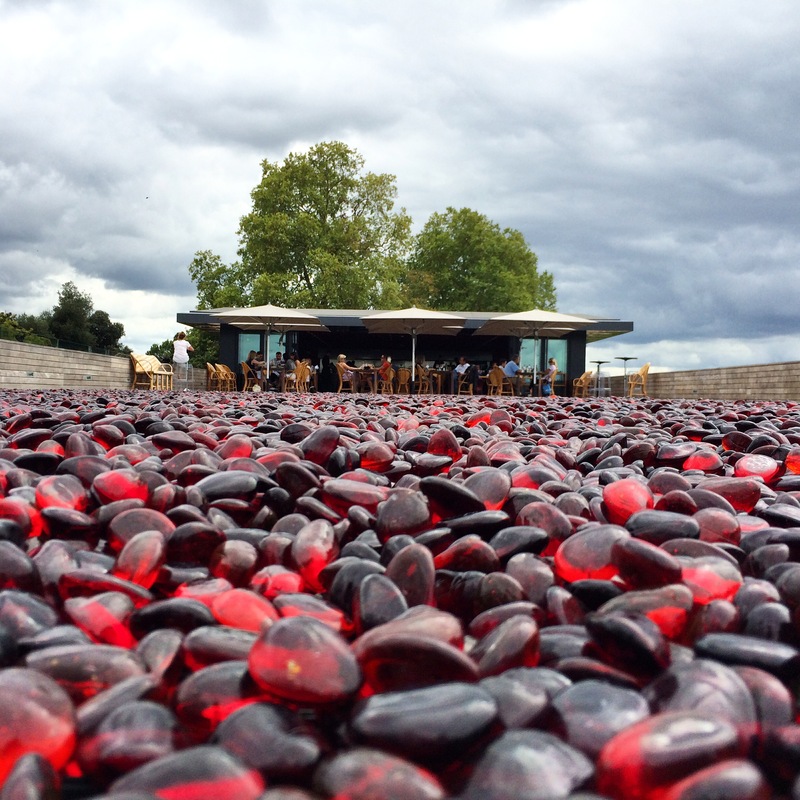 Clad the entire extension in graded layers of rouge glass (or glass look alike), build a glass box on one half of the top and then ‘pave’ the other half in graduating glass pebbles in rouge: and “bingo” – smart dining place! I should add that the landscaping is pretty smart too. yep, the terrace is rouge! Go on, have a peek http://www.laterrasserouge.com it’s right next door to one of the region’s top wineries: “Chateau Cheval Blanc” which also has amazing architecture. Lunch was languid and liquid. The food was luscious: – super fresh salad with mousse of goat cheese and honey, duck with orange and anise, fromages for uno duo, café and chocolate cake for the other duo. Siestas and walks to recover before dinner which was also languid and liquid. Food again was good. 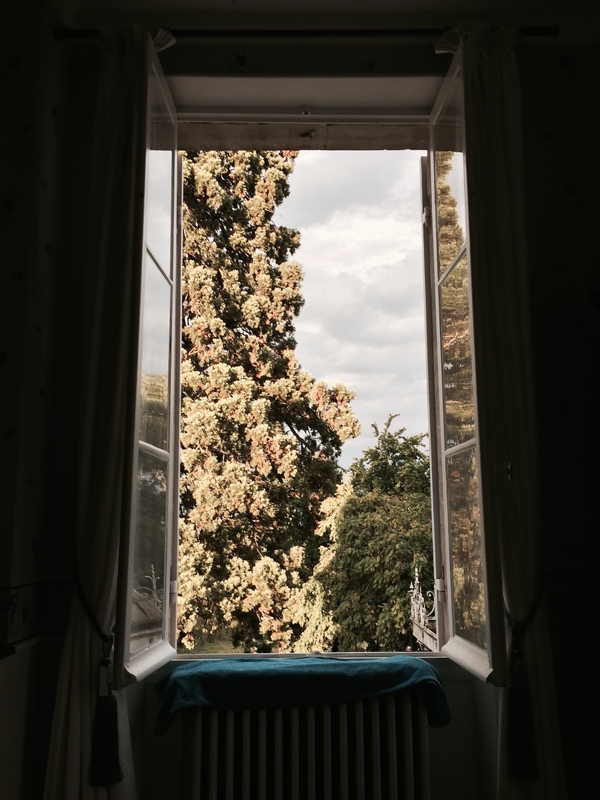 Finally – bed at midnight. 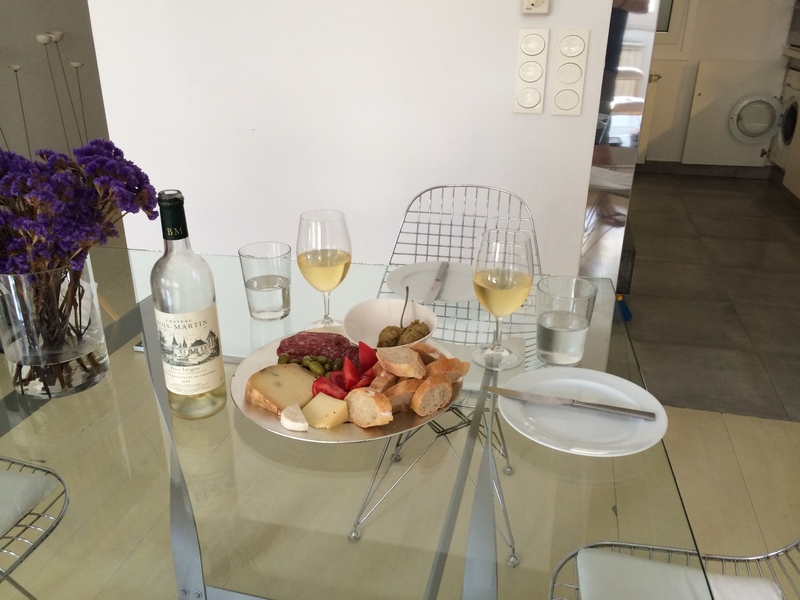 Wining and dining is so much hard work, but some one has to do it! 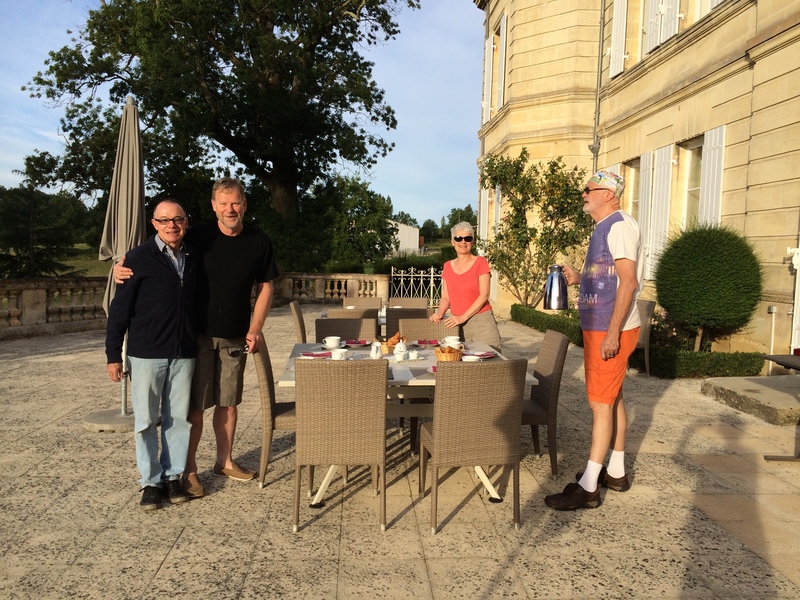 We breakfasted sur la terrace, before heading south and into Spain via the Saturday morning markets at the curiously named [to us] town of Sainte Foy de-la-grande. We arrived there early, shopped big, squeezing the produce into the car and taking off. We now have enough cheeses (fromages) to sink a battle ship, superb tapenades made of green olive and basil and an even better one made of artichoke hearts and green olives. Numerous saucissons (duck, pork with chilli, pork with tomato), cans of duck rillettes, too many delicious strawberries and eight different types of tomatoes – just for an indication…. I was born to shop for food! The trip was about three hours and more or less went to plan. The Sat Nav that came with the car is good, fiddly to set, but only slips up when there are road works and it has a hissy fit. It was a tad unsettling seeing signs for the first two hours pointing to Bordeaux, that we’d just left! Other than some toll booth problems, things went O.K.. The tolls did not like my credit card and they seemed to appear with monotonous regularity. As our meagre holdings of suitable cash dwindled, we did worry that we may be spending the night on the side of the highway. Thankfully at the Spanish border they still employ human beings to take your toll and the nice young lady was quite happy with any coinage, and waved us into Spain. It was then a case of follow the Sat Nav directions, and ‘bingo’ we arrived at the correct square where “Luis” our charming host was waiting. We were only 12 minutes late! There seemed to be some problem with us parking the car in the underground car park, but Luis assured us, “Just leave the car here with the hazard lights flashing, and we will come back for it later!” So I left the car in the “NO PARKING:TOW AWAY!” zone. It was the only car in the entire Plaza, so it did stand out a little. 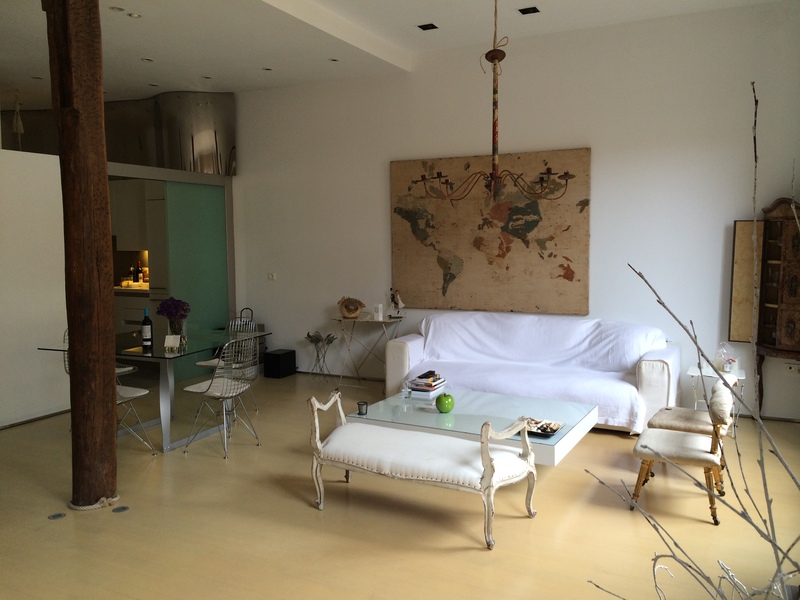 Our new abode in the old city of San Sebastian is large, white airy and modern, even if it is one of the few building to survive the 1813 siege of San Sebastian. The interior is very 2014. Everything internal had obviously been gutted, leaving only the internal perimeter walls with the huge walnut timber supports that the building was built around remaining. It’s my type of space. We are next to what was once a convent and is now the Museum of Barsque Society. The 16th century San Vicente Church is at our front door, the 18th century Basilica of Saint Maria is down our back lane, and the Constitution Square is in the next street (calle). 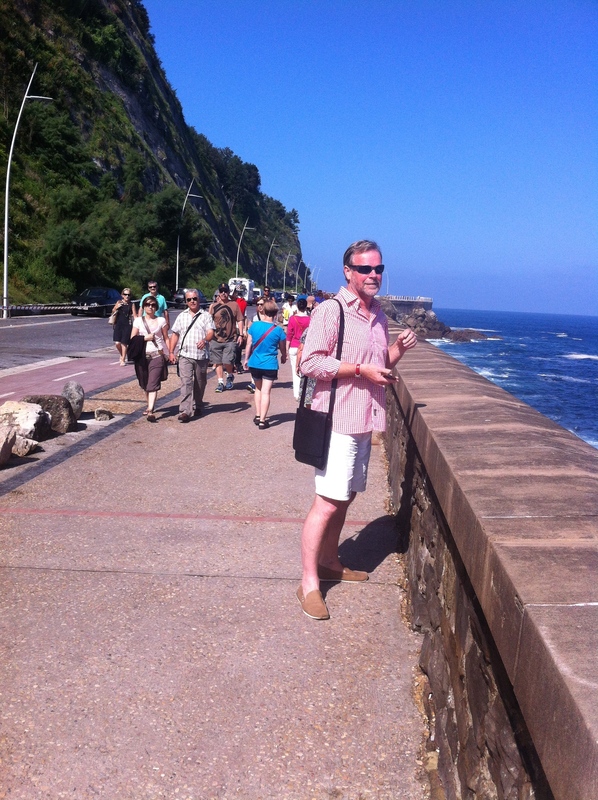 You could say we are in the centre of the universe of old San Sebastian. Oh, I forgot; the windows all look up at “Monte Urgull”. When I walk (as he sleeps) there is barely a sole around, other than the dozens of council workers who are out scrubbing every street, path, wall or anything left standing, after the night before! We are very happy yet again with our temporary home. Our first night was spent walking the old city, popping in and out of lots of bars, having a glass of wine and a “pintxos”. What’s a pintxos? It’s a tapas on steroids that this town is famous for. Every bar is piled high with these little delights, and to partake correctly, one should move from bar to bar having a glass and one pintxos. Thankfully the glasses are about 2/3 of our normal pour. The best bars are so crowded at night it’s hard to move! The staff are amazing however. How they do it is beyond me. It’s totally crazy. Orders going left and right, but all done with good grace. So we are drinking lots of Tempranillo, Riojas and Txakoli, the latter is the white of the area, and is fresh, dry, fruity and perfect for those salty fishy pintxos. Its fun! Sunday was spent walking; me early, us later. We walked the entire seafront on the sand, then took the funicular to the top of “Monte Igeldo” that guards the other side of the harbour. The mount is a beautiful hill with the remains of an old tower. Perhaps sadly, someone has come along and put in a theme park! We then walked back, had lunch (at 3pm which is becoming normal), then a very short siesta before joining in all the fun with the celebrations mentioned earlier. We took to the town, but I’d booked a restaurant for dinner. It was seriously crazy on the streets and I could not face the crush at the bars, so I found a place called “La Fabrica”. I’d booked us in for 9pm. We set off down one calle and up another, only to meet up with the drummers, pipers, and brass bands again! They seemed to be walking every street in the town and it does take about 15 minutes for the long line of them to pass – but it was very spekky! On to our dinner. 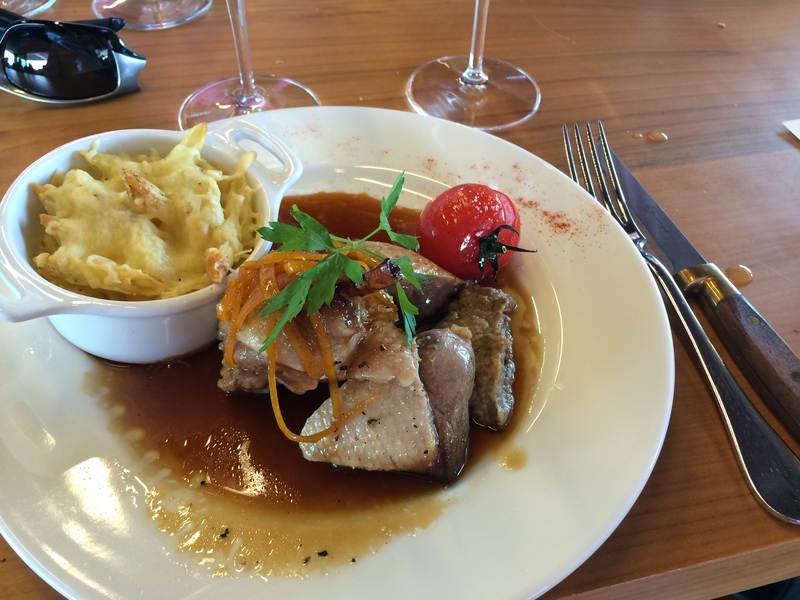 It has to be the best valued meal I have ever eaten – try nine courses and a bottle of wine for 39 euro each. The food was the best of the trip so far. So here goes: move on you non foodies! 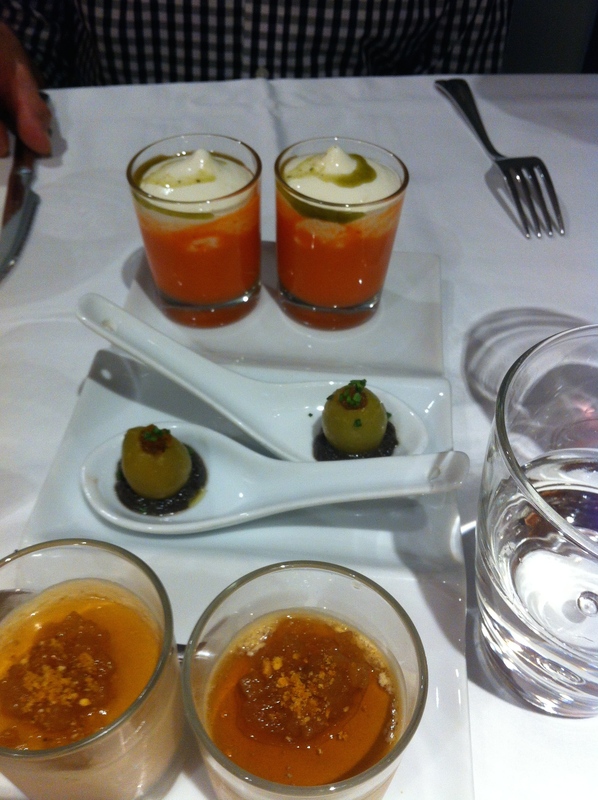 First plate was really three dishes, Watermelon and tomato soup with basil, [think Gazpacho in a glass with a basil crème only 1000 time better], followed by a a spoon holding a green olive filled with vermouth & black olive paste. Then to finish, a foie gras crème with caramelised apple and toasted corn powder. The last I could have eaten 6 of and have been quite happy to bypass heaven! 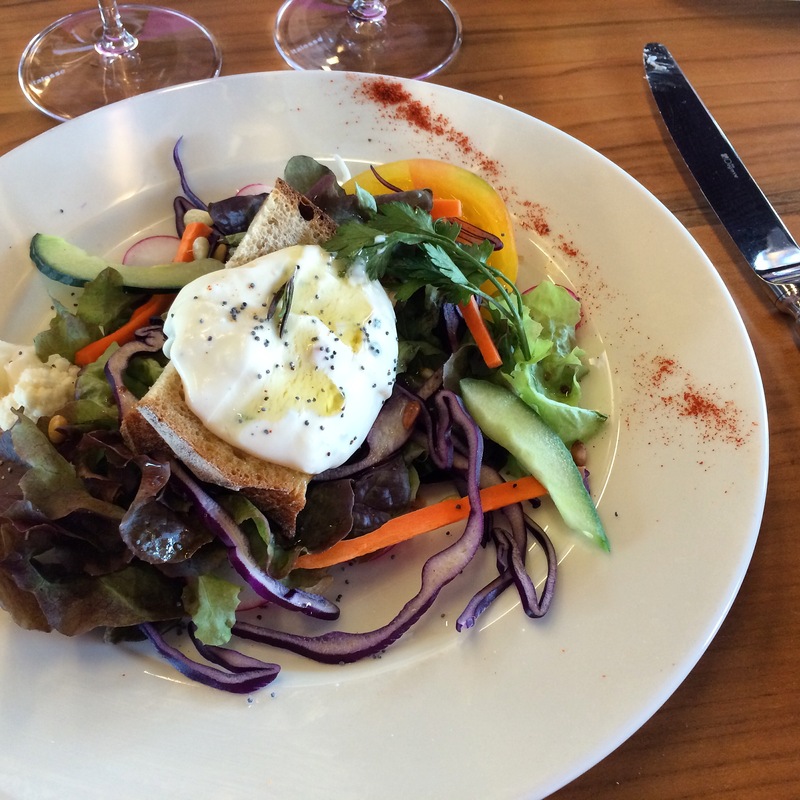 We’d chosen a bottle of Montebuena 2011 Rioja from the wines on offer, which worked with every dish. 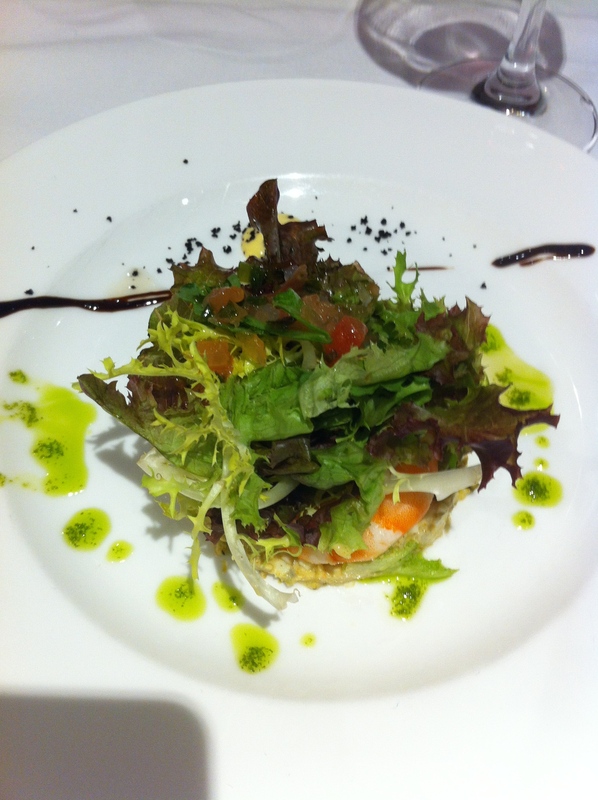 Next number was a king prawn salad with mustard emulsion and dried fruit vinaigrette. Perfect! Moving right along – a single ravioli of wild mushroom risotto with a truffle sauce to die for. The final entrée was a steamed cod with crab in a ‘donosti’ style, (the area is called San Sebastian Donosti), with fennel sauce. He did a bit of a double take, as the aromas were a tad overwhelming for this “mock fish patty boy’! 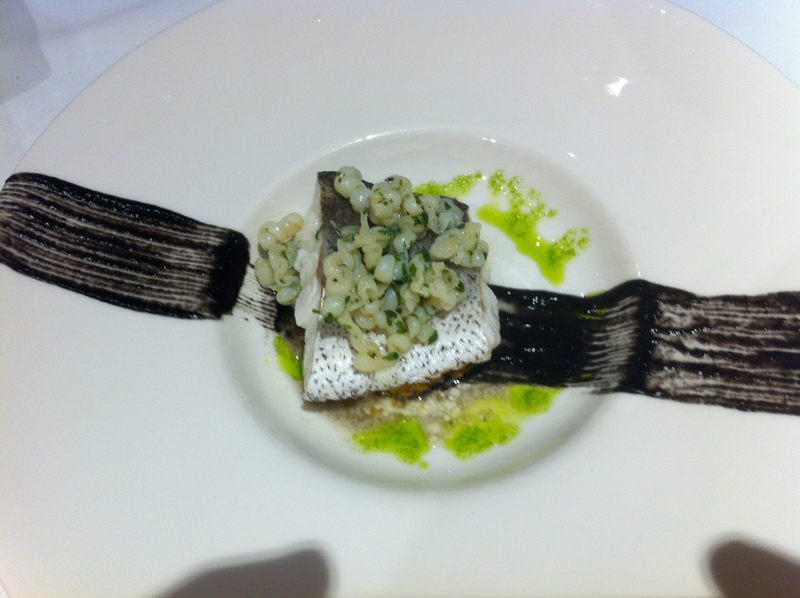 [There was also some squid ink involved!] The taste was perfect though, very gentle and moist. Whilst He found the aroma too ‘fishy’ it did not carry through onto the palate. We were concerned about the main course from a size perspective, as some of the ‘entrées’ were not that small. However, the mains were quite small thankfully. 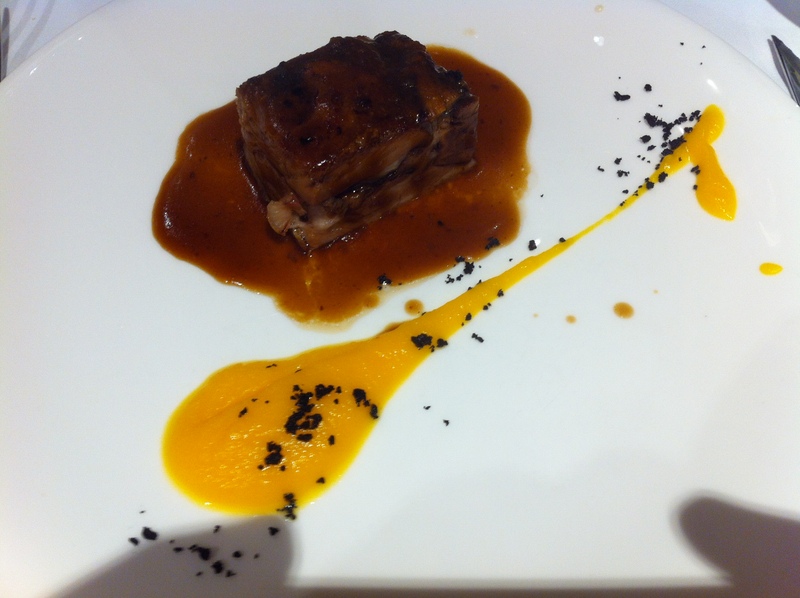 We had a choice, so I ordered the lamb confit with pumpkin puree. Himself chose the rib-eye on a bed of very creamy cauliflower. If we were to be critical, the beef was a tad sinewy, and as he had ordered it, I took one look at his face and we immediately changed plates! I loved the flavours, but He can’t move beyond the texture issue! 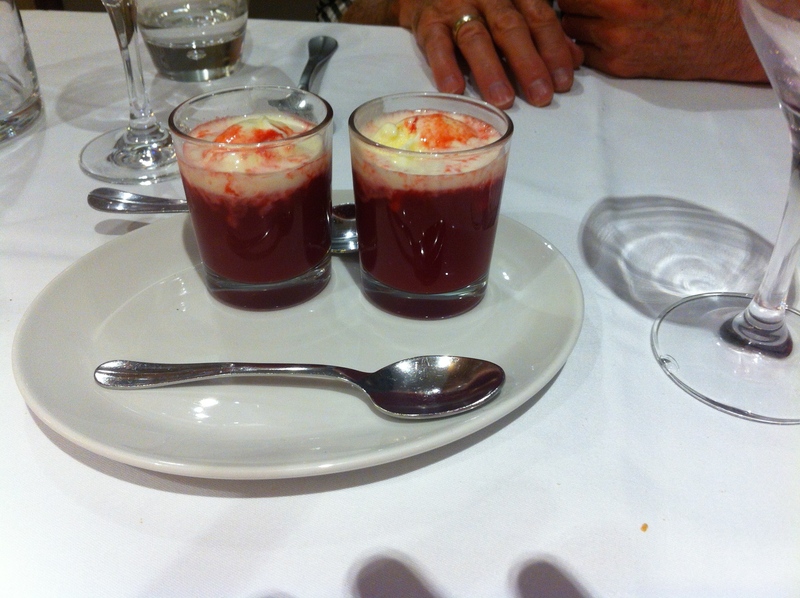 The ‘cleanser’ was a small glass of red fruit puree, with a sphere of yogurt ice-cream. Fabbo!! Dessert was also a choice, He won the Apple Tart (what a tart he is) with caramelised cider and lemon cream. A puff of puff pastry with apples slow-cooked in cider, a triumph for him. Me, I won big time with a tri-layered number of chocolate textures. 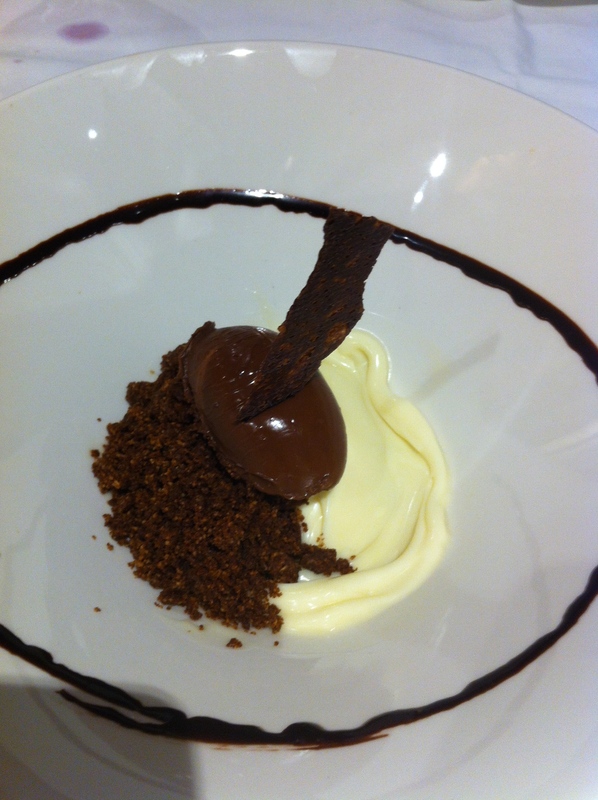 A white chocolate ice-cream thingy, with a rich chocolate mousse and crunchy biscuit crumbs on the side. Sadly their set menu ran for a month, otherwise we would just have dined there every night, but I am happy to do the entire menu again, it was superb! By the way all through dinner we could hear the drums, guns and singing of the celebrations. As we walked home at mid night, things had slowed down on the song and dance front, but many drummers and men in uniform were happily working the bars very happily! Now ‘San Seb’ has more Michelin starred restaurants than anywhere else in the world. We had not planned on getting carried away on this trip , but we do have our names down for one or two others, but I’m not holding my breath. They book out months in advance! The credit card says “thank you” in advance if they all come to nought! Stay tuned!